Hos Dorte: Nyd dagen, den er din! fødselsdag i går. Håber du havde en dejlig dag. og et motiv-Milly Mae- fra 'My Besties'. blå som tillægsfarve i stedet for orange eller grønt. Tekststemplet er fra Hobbyboden, en butik jeg varmt kan anbefale. På taggen er der fæstet en lille guldsmed charm. med henholdsvis Glimmer Mist og Distress Ink. Jeg er egentlig ganske fornøjet med resultatet. har brugt, den er fra Joy! Crafts. Beautiful Dorte...love your colouring and the pretty papers! Enjoy your weekend! this is very beautiful Dorte, love it. what an absolutely precious card! love those flowers! Gorgeous Papers, fab embellishments and lovely coloring. So lovely, Dorte! I love the sweet girl and flowers. Thanks so much for playing along with the Simon Says Stamp Wednesday Challenge! Very beautiful card did you made. Pretty stamp colouring, beautiful colours and embellishing matching with papers. 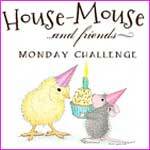 Thanks for playing along with us at My Besties Challenge anything goes with your card. Hope to see you again next week also!. Elena F.
Such a pretty image and a lovely card. Your papers match beautifully with your embellishments. 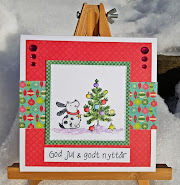 A gorgeous card Dot, A great design and you've used my favourite Maja papers!!! Lovely colouring of the sweet image and fabulous details!! !